As one of the top event planning companies in San Francisco, Hunter Events puts experience and skill to the test to search and select the finest venues around the world — appropriate to the Client’s unique and specific needs. Located just a few miles from the Client’s World Headquarters, the Paramount Theatre, completed in 1931, stands as one of the finest remaining examples of Art Deco design in the United States. Restored to its original splendor, meticulously maintained, and fully upgraded to modern technical standards, the theatre is now a National Historic Landmark and serves all the arts. 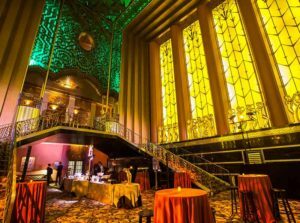 Hunter Events’ desire to always introduce both the Client and their guests to fascinating and unique venues they may not otherwise experience, was the driving force in selecting the Paramount Theatre for this Corporate Company Event. The character of the building completely embodied the theme of the Corporate Anniversary Event and no other venue could have provided such ambiance. Actors dressed as 1930’s-era “Gangsters & Cops” and dashing “Gals & Gents” provided the 1930s aura throughout every corner of the venue. Plus, two “Cigarette Girls” offered old-fashioned candy, boutonnieres and handmade chocolate cigars to guests during the event. To capture the essence of the evening, a professional photographer took guests’ photos in a custom-created Speakeasy Lounge. Hunter Events also hired a snappy Jazz Quartet and a Deco Dancing Troupe of 10 beautiful dancers to round out the theme. Guests at the Corporate Anniversary Event were able to celebrate their achievements in a most unique and unforgettable way. The non-stop entertainment impressed each and every attendee. 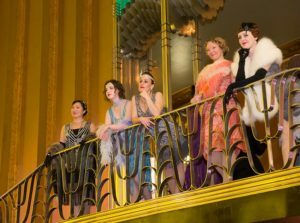 But above all, the beauty and elegance of the remarkable Paramount Theater defined the event like none other. The Client was pleased with the venue’s hospitality, the flawless performances by over 30 entertainers and the outstanding service and event planning provided by Hunter Events.